Art Into Poetry, Wine Tasting – Tonight! “Art Into Poetry” returns as local Boys and Girls Club members write poetry inspired by the art in this month’s shows with in a workshop with Ivy Tech students. Also back by popular demand is wine tasting by Big Red Liquors. Lynne Medsker, “Intricate Elements”, digitally-created art. Paired with Mercedes Eguren Cabernet Sauvignon 2010. We recommend arriving early for the best chance of participating in wine tasting. 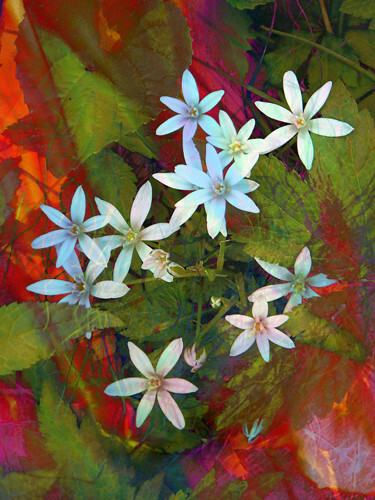 Digitally-created art by Lynne Medsker. Martin Beach, “Lithomorphs”, granite sculpture. Paired with Bollig Lehnert Trittenheimer Apotheke Riesling, 2010. Granite sculptures by Martin Beach. I am busy this evening (and I’m sure tomorrow morning!) getting everything prepared to hang the show at Sugar Creek. I am getting SO excited, I think it’s going to be an awesome display! Tonight I’m doing the paperwork type things that go along with a show, label/price tags, inventory lists…the “behind the scenes” stuff that makes a show a show but most people don’t think about. I am always amazed at how much time artists end up spending doing things other than making art. Many times because it’s what you have to do to get your art out there, opportunities rarely fall in your lap! They take application forms, submissions, copies of artist statements & resumes, letters of recommendation and that’s just for the chance to show your work! Occasionally, it is easier to do all the paper stuff than it is to start or complete a current art project. I have avoided creating work on many occasions by submersing myself into the “business” of art. I almost always wish, at the end of the day, that I’d chosen to be creative! Right now I am basically in a state of letting out a big exhale – whoosh – and stepping back for a bit. I have cranked out over 20 pieces of new art in around 2 months. Like the image above a few of the pieces were digital/photo art, which (other than clicking my mouse a few thousand times!) doesn’t take quite the time & energy, but the majority of them were all “built from scratch” hand assembled mixed media pieces. Add in teaching some classes, a photo session or two, judging a show and my normal schedule caring for my grandson and the rest of the family and it’s been hectic! I don’t think I paid much attention to how hard I was pushing to get them done until I was finished. Now I am tired out and ready for a break! At the same time I am exhillarated to have so much new work to show. I guess that makes me satisfyingly worn out. 🙂 I found out earlier this week that the classes I was scheduled to teach at OASIS this month were cancelled due to low enrollment. I suppose I should be disappointed but the truth is I was kind of relieved. They would have added to the chaos that will be the month of June so it turned out to be a blessing to be able to take them off the schedule. Things seem to work out for the best, even though I am often convinced otherwise! Later this week I will be picking up my finished ceramic pieces. I am SO anxious to see how they look all glazed and fired. They will be a bit of a late addition to the show (it officially opens on Thursday) but I plan to have them hanging before the reception. Even if I have to hang them in my little studio space and point people in that direction to see them! I will be sure to take photos and post them once I’ve got them home & finished (most of them are getting some metal and wire added to them before they hang). That’s all the news for tonight, just hadn’t checked in this week and thought I would put in a quick update. Take care!